March 2015 n Performance & Hotrod Business n 43 You can also tune multiple maps for various conditions and use the map switching feature. It data-logs every chan- nel with speed up to 1 KHz per channel and storage up to 64 GB via an external drive. It outputs to third-party dashes and loggers, and comes in a sealed enclosure with weatherproof connectors. The best way for shops to break into the Racing Electronics market is … … by offering installation and support services for the prod- ucts they are selling. Having a quality installation center can drive pull-through at the front counter. If you sell EFI, having a dyno and dedicated tuner can bring repeat business as racers continue to make changes to their engine combination, and can build your reputation in racing circles if quality work is performed. The areas of the market that are seeing the biggest impact from Racing Electronics include … … all of them. What's exciting for us are the guys that are coming to us with big-blocks using carburetors and ask- ing how they can get an Infinity on their engine. We have engine harness solutions to make the conversion easier, and this translates into more control for drag cars and even off- shore racing boats. Even in racing series where there are restrictions, there are advantages. 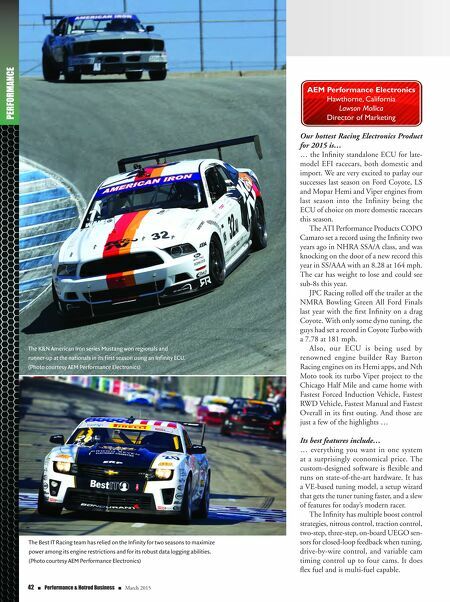 The Best IT Racing team that competes in Pirelli World Challenge with Camaros is able to use the software to tailor the limited amount of power they make to a driver's particular style, and also use the on-track data to analyze on-track performance in addition to engine health. In Rallycross Lites, where the Infinity is the spec ECU, all of the series that use it (FIA RX Lites, GRC Lites and Scandinavian RX Lites) are able to maintain parity among the vehicles by tuning them and then locking out the team from the maps, while still allowing the teams to pull data from the units for analysis. A tip for increasing Racing Electronics sales in 2015 is … … take advantage of factory support and training. For instance, we offer two-day training classes at our facility and in select regional areas. This not only speeds up the general learning curve and comfort getting to know the software, but also provides opportunities for face time with company engineers and customer service techs. Another tip is to find ways to support the manufacturers in your region by being at the events and races they exhibit at. This creates a win-win situation, because they can refer leads to you they receive at the track and you can speak to the quality of their products firsthand from an "in the trenches" perspective. Dealer & Distributor Inquiries Welcome DESIGN ENGINEERING INC. THERMAL ACOUSTIC CONTROL THERMAL ACOUSTIC CONTROL THERMAL ACOUSTIC CONTROL THERMAL ACOUSTIC CONTROL THERMAL THERMAL THERMAL THERMAL BOOM MAT does both! 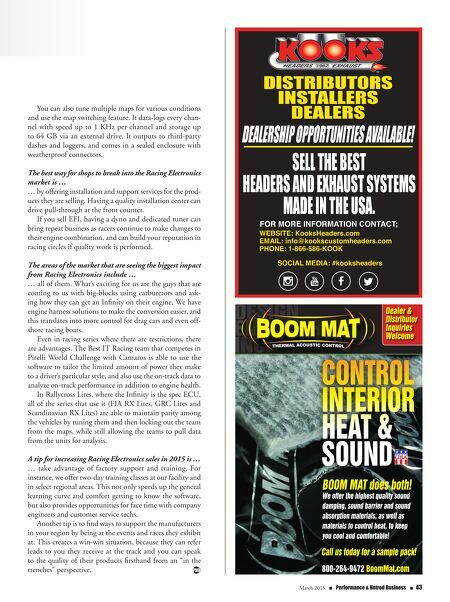 CONTROL INTERIOR HEAT & SOUND 800-264-9472 BoomMat.com We offer the highest quality sound damping, sound barrier and sound absorption materials, as well as materials to control heat, to keep you cool and comfortable! Call us today for a sample pack!